Nearly all art is created out of memory. 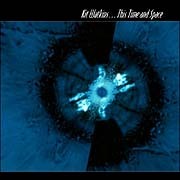 On This Time and Space (58'59"), Kit Watkins seems truly in tune with this idea. The seven tracks conjure up a hushed intimacy of whispered tones and heartrending synthscapes - aural recollections of tranquility, sacred bliss and the inner reflectivity of the mind. Watkins is renowned as a musician of both capacity and credentials, one with image matching substance. He often explores familiar themes yet consistently comes up with music that is more expansive than cliches. The rewards of his music are related to the level of engagement - with fulfillment increasing along with attention paid. But most listeners will slip between states of awareness, enjoying the wonderful journey between their internal life and the resonating listening space. Ultimately, what matters most is the emotional power of the music. As breathing synth pads shift and drift amongst soft expressive melodies, the music radiates warmth and the faint light of hope. Possessing the probing nature of Spacemusic, the drifting quality of Ambient and the embracing comfort of New Age, This Time and Space is the culmination of an enlightened musical intelligence; one that gives shape to ethereal musical lines, structure to amorphous harmonic forms and, to the listener, a sense of the unique interconnectivity between sound, spirit and the vastness of the universe. The CD This Time and Space has a companion DVD which contains slowly evolving computer generated and manipulated images set to the Kit Watkins soundtrack found on the audio CD reviewed above. Each "chapter" corresponds to a song title and typically gives the perspective of perpetually zooming inward through bright colors and strange landscapes, toward an illusive destination - be it deep space, the winter sky or some dreamt of city. Somewhat of an "Ambient" experience, the sound and imagery of the This Time and Space DVD is meant to be taken in along with the entirety of your surroundings. Below are just a few of the wonderful images from the DVD.